Mass shootings, floods, and other crises and disasters lead the news on a daily basis. The FBI reports an increasing trend of active shooting situations in the United States (Blair & Schweit, 2014). The Gun Violence Archive (2016) verified there were 242 mass shootings in the United States in 2016, as of August 14. Additionally, in 2014, there were 324 natural disasters worldwide (Guha-Sapir, Hoyois, & Below, 2015). Social workers, fueled by an obligation to assist during emergencies, are often on the frontlines supporting survivors and others impacted by these devastating events. With the increasing demands produced by crises and disasters, it is imperative for social workers to utilize all the resources available to them. Many social workers today are enlisting the help of an unusual partner in their postdisaster interventions; that compassionate colleague is a canine. In 2010, Risley-Curtiss found that almost 25% of social workers are using dogs in their practices. Most social workers are familiar with therapy dogs, but not all therapy dogs have what it takes to be certified as a crisis response dog able to effectively provide support in the chaotic, crowded, disrupted, and stimulating environment of a disaster. Animal-assisted crisis response (AACR) teams are specially trained, evaluated, and credentialed dog teams who have at least 12 visits providing animal-assisted therapy in various settings (HOPE AACR, n.d.). These dog teams must pass an intense evaluation, complete a three-day certification workshop, and maintain continuing education in stress management, incident command, self-care, and crisis intervention (HOPE AACR). There are published national standards for AACR, so social workers should be sure that teams responding meet or exceed these criteria. One such national organization where social workers can request qualified volunteer teams to assist them is HOPE AACR (www.hopeaacr.org). These AACR teams, which do not self-deploy, work with various disaster responders and agencies upon request to provide canine comfort following crises. These caring comfort dogs demonstrate healing qualities to assist responders in facilitating crisis intervention. James and Gilliland (2013) indicate three conditions that are critical in effectively managing crises: empathy, genuineness, and acceptance. A primary skill in communicating empathy is listening, and crisis response dogs are very skilled at this because they don't talk back. They silently comfort and communicate acceptance to those in need with a nudge of the nose or cuddling lean. The dogs easily communicate genuineness as they display spontaneity and don't have a need to display a certain role or position. The dogs are skilled at providing unconditional positive regard as they eagerly approach and provide affection regardless of any differences, statements, or actions of those they serve. These essential traits can provide vicarious connections for the responding social worker, enabling them to more quickly and effectively establish a helping relationship. Recalling the statement made by a previous, mandated counseling client, "I guess I will see the lady [counselor] with the dog." It was Maggie, the crisis response dog, who helped bridge the gap, establish rapport, and develop a very successful therapeutic relationship. In addition to anecdotal evidence, there is much research supporting AACR. Early intervention following crises and disasters requires many critical tasks. According to Orner, Kent, Pfefferbaum, Raphael, and Watson (2006), strategies should focus on decreasing arousal, offering comfort and support, and encouraging social connections. AACR is an effective adjunct to the support and aide being offered by social workers. Research supports the disaster intervention goals by offering physiological, emotional, and social benefits (Eaton-Stull & Flynn, 2015). Petting a dog can help calm a survivor and offer physical comfort at a very uncomfortable time. Beetz, Uvnas-Moberg, Julius, and Kotrschal (2012), in a meta-analysis of 69 studies involving animal-assisted interventions, found well-documented evidence of the physical benefits, including effects such as decreased heart rate, blood pressure, and stress hormones. Since physiological arousal has been linked to the development of PTSD, offering a unique early intervention may prevent more serious, long-term effects in the future. Emotional reactions to crises can vary, but two of the most common include fear and anxiety (National Center for PTSD, 2010). Strategies to decrease these emotional reactions are essential to recovery. Chandler (2008), in her experience during Hurricane Katrina, believed the dogs were more effective than other strategies in offering nurturance and decreasing anxiety. Additional research on the anxiety-reducing benefits of dogs can also be found at the Virginia Commonwealth University Center for Human-Animal Interaction (www.chai.vcu.edu). Finally, a critical role of a social worker is making connections with those in need. Establishing rapport and creating a working relationship with survivors helps to assure their needs are identified and addressed. Many disaster responders have witnessed firsthand the benefits of the AACR dogs in facilitating these connections. Following 9/11, Greenbaum (2006) described the dogs as a helpful tool in establishing rapport, connecting, and normalizing. In her experience responding to tornadoes and fires, Graham (2009) calls these canines a compassionate presence. Homish, Frazer, McCartan, and Billittier (2010) viewed the dogs as a beneficial supplement after the crash of Continental Flight 3407. Eaton-Stull (2015) describes how in the aftermath of the Virginia Tech shootings, her crisis response dog Maggie provided a source of support while facilitating connections with impacted students. Bua (2013) calls these AACR teams "extensions of responders." No matter what they are called, the evidence is clear that these AACR teams can offer social workers a beneficial evidence-based tool to meet the needs of disaster survivors. — Yvonne Eaton-Stull, DSW, LCSW, is an assistant professor at Slippery Rock University in Pennsylvania. She is also a canine handler with HOPE Animal-Assisted Crisis Response and has provided intervention following crises and disasters throughout the United States, such as the Virginia Tech shootings, Indiana tornados, and Washington, DC, Navy Yard shootings. Beetz, A., Uvnäs-Moberg, K., Julius, H., & Kotrschal, K. (2012). Psychosocial and psychophysiological effects of human-animal interactions: The possible role of oxytocin. Frontiers in Psychology, 3(234), 1-15. Blair, J. P., & Schweit, K. W. (2014). A study of active shooter incidents in the United States between 2000 and 2013. Retrieved from https://www.fbi.gov/about-us/office-of-partner-engagement/active-shooter-incidents/a-study-of-active-shooter-incidents-in-the-u.s.-2000-2013. Bua, F. (2013). A qualitative investigation into dogs serving on animal assisted crisis response (AACR) teams: Advances in crisis counseling (Doctoral dissertation). Retrieved from http://hdl.handle.net/1959.9/279067. Chandler, C. K. (2008, March). Animal assisted therapy with Hurricane Katrina survivors. Based on a program presented at the ACA Annual Conference & Exhibition, Honolulu, HI. Retrieved from http://counselingoutfitters.com/vistas/vistas08/Chandler.htm. Eaton-Stull, Y. (2015). Animal-assisted interventions in social work practice. In K. Corcoran & A. R. Roberts (Eds. ), Social workers' desk reference. 3rd ed. (pp. 281-287). New York, NY: Oxford University Press. Eaton-Stull, Y., & Flynn, B. (2015). Animal-assisted crisis response. In K. R. Yeager & A. R. Roberts (Eds. ), Crisis intervention handbook: Assessment, treatment and research. 4th ed. (pp. 599-606). New York, NY: Oxford University Press. Graham, L. B. (2009). Dogs bringing comfort in the midst of a national disaster. Reflections, 15(1), 76-84. Greenbaum, S. D. (2006). Introduction to working with animal assisted crisis response animal handler teams. International Journal of Emergency Mental Health, 8(1), 49-64. Guha-Sapir, D., Hoyois, P., & Below, R. (2015). Annual disaster statistical review 2014: The numbers and trends. Brussels: CRED. Retrieved from https://www.cred.be/sites/default/files/ADSR_2014.pdf. Gun Violence Archive. (2016). Mass shootings-2016. Retrieved from https://www.gunviolencearchive.org/mass-shooting. Homish, G. G., Frazer, B. S., McCartan, D. P., & Billittier, A. J. (2010). Emergency mental health: Lessons learned from flight 3407. Concepts in Disaster Medicine, 4(4), 326-331. HOPE AACR. (n.d.). HOPE animal-assisted crisis response: Comfort in times of crisis. Retrieved from http://hopeaacr.org/become-a-member/. James, R. K., & Gillilland, B. E. (2013). Crisis intervention strategies. 7th ed. Belmont, CA: Brooks/Cole, Cengage Learning. National Center for PTSD. (2010). Mental health reactions after disaster. Retrieved from http://www.ptsd.va.gov/professional/pages/helping-survivors-after-disaster.asp. Orner, R. J., Kent, A. T., Pfefferbaum, B. J., Raphael, B., & Watson, P. J. (2006). The context of providing immediate postevent intervention. In E. C. Ritchie, P. J. Watson, & M. J. Friedman (Eds. ), Interventions following mass violence and disasters. (pp. 121-133). New York, NY: The Guilford Press. Risley-Curtiss, C. (2010). Social work practitioners and the human-companion animal bond: A national study. 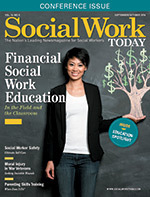 Social Work, 55(1), 38-46.